Fabulous Pharaos: Gisele Bündchen & Heidi Klum steal Cleopatra’s style! It’s been two thousand years since her existence yet Cleopatra is still in vogue, as proven by the fact that both Heidi Klum and Gisele Bündchen stole her style this Halloween! Heidi recently posted a sneak preview of her glamorous Cleopatra costume on her website but is yet to showcase the outfit properly. Due to Hurricane Sandy, the former Victoria’s Secret model has postponed her 13th annual Halloween bash until nearer Christmas so unfortunately we won’t be seeing her in costume until then. With aqua blue eyeshadow, thick eyeliner and beaded braids, I think Gisele looked every inch the beautiful pharaoh. 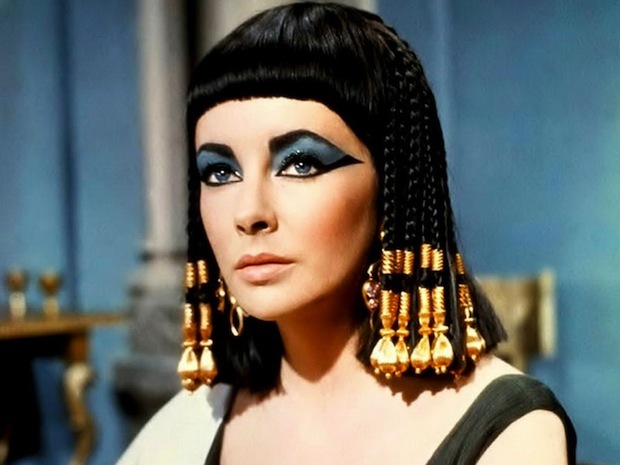 Needless to say her vibrant makeup was also informed by Elizabeth Taylor’s look in the 1963 film Cleopatra. Speaking of Cleopatra’s surviving style, I’m fascinated by the way Egyptian makeup has evolved over the centuries yet retained its original character. It’s a testament to the Egyptians’ fashion sense that their ancient style has withstood the test of time; you still see it everywhere, permeating society in the subtle shape of winged eyeliner, thick eyebrows, lustrous highlighters and luxurious eyeshadows. And at Halloween, it comes back to haunt us in its full, dramatic form, with ladies all over the world (Victoria’s Secret models included) donning gorgeous Cleopatra costumes! Yesterface fact: Kohl was used to protect the Egyptians’ eyes from infection, deter flies and deflect the sun’s glare! For more facts about ancient Egyptian makeup and for tips on how to look like Cleopatra, check out Yesterface’s Egyptian Makeup Tutorial. To see what cosmetic tools the ancient Egyptians used, see Yesterface’s post on the Kelvingrove Art Gallery and Museum.